Tijdens zijn verblijf in Nuenen groeide Van Gogh uit tot een groot kunstenaar. Zijn technisch vaardigheid is in deze periode enorme gegroeid. Vincent van Gogh hat während seines Aufenthalts in Nuenen das wichtige Gemalde gemacht. 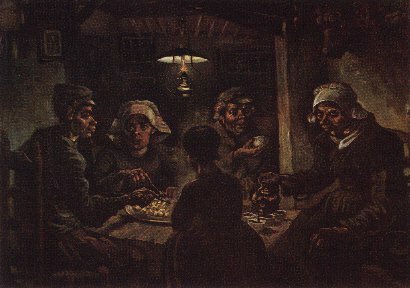 La peinture plus importante, que Vincent a faite dans son sejour à Nuenen, est "Mangeurs des pommes de terre". During his years in Nuenen Van Gogh emerged as a great artist. Many of the paintings frome this period depict peasants working in the fields--a subject Vincent was particularly fond of. The works themselves clearly show an increasing assuredness of technique. Van Gogh"s time in Nuenen proved to be a formidable learning experience as Vincent sought to define his own unique style. Many of the portraits of peasants can be viewed as studies through which Van Gogh was able to execute what many consider to be his first great painting. Rond 1880 woonde hier Martien Aarts, keuterboertje en thuiswever. Van Gogh Art Prints on Canvas Reproduction prints on canvas, Giclees of Vincent Van Gogh famous paintings, his Sunflowers, Portraits, Gardens, Landscapes and more.